In part 1 of this Diablo 3 Barbarian Leveling Guide, I will be touching on every aspect of the barbarian class, particularly as they relate to the fastest leveling. Please keep in mind that at the time of this article, we are still currently in the Diablo 3 Beta and thus some of this information will likely be changed and updated as we near the final release date. Barbarians are masters of close-quarter combat who dominate the battlefield with their enormous strength, mighty armor and devastating weapons. As the story goes, the barbarians were born and bred to protect Mount Arreat but after its fall, they became directionless wanderers in search of a new purpose. Fortunately for them, Diablo 3 seems to offer them quite a bit of action! When choosing to play as a barbarian, you have the option to pick either male or female. I really like this feature of Diablo 3, as it definitely provides a greater level of customization and connection with your character. Barbarians benefit greatly from strength, which not only increases their armor but also their damage output. It’s definitely a good idea to stack as much strength as you can get your hands on, as it will help you absolutely tear through your enemies. The main barbarian resource is called Fury and is used to perform some of their most powerful attacks and abilities. Fury is generated any time the barbarian gives or takes damage in combat. For this reason, the barbarian class benefits from a playstyle that moves quickly from one group of enemies to the next. 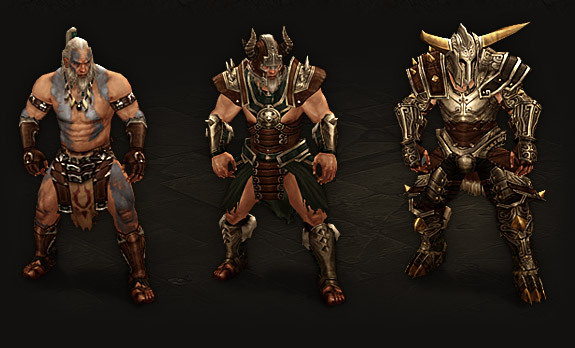 I would definitely keep a close eye on the barbarian as a viable option for quick leveling in Diablo 3, as their fury generation, heavy armor, and enormous damage output will lend itself quite well to powerleveling your character at warp speed. Barbarians in Diablo 3 will be able to use large One-Handed Mighty Weapons, Two-Handed Mighty Weapons, as well as Mighty Belts. 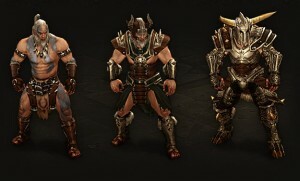 Currently, it appears that barbarian armor will follow a progression from simple leather armor at low levels, to helms and plate armor and finally to the pinnacle of protection, head-to-toe heavy armor that will deflect and absorb enormous amounts of enemy damage. As if barbarians weren’t sturdy and resilient enough already, they have a wide range of barbarian shouts available to help them out during battle. I will cover shouts in much more detail in a future post, but essentially shouts provide buffs to allies, debuffs to enemies. Their shouts make the barbarian class a very worthy addition to any group looking to mow down enemies on their quest to level 60. All this info is great…it makes me really excited for the launch of D3! Long live Harrogath! Thanks, Finkployd! I’m insanely excited too! Previous post: Diablo 3 vs WoW: Which Is It Gonna Be?